As Southeast Region Manager, Mark Dennison provides technical product and sales support to zoos, aquariums, veterinarians as well as private exotic animal owners and the PMI retail sales team and PMI feed dealers. His territory covers the southeast United States. Mark obtained his bachelor of science degree in animal science at North Carolina State University. Mark’s animal care experience started with volunteering at Zoo Atlanta, working at multiple veterinarian clinics and the reptile laboratory at NCSU. He has been part of the Land O’Lakes team since 2011. His first role was in the Dairy Foods Research & Development division, where he formulated new dairy-based products and developed new technologies that enabled innovation. 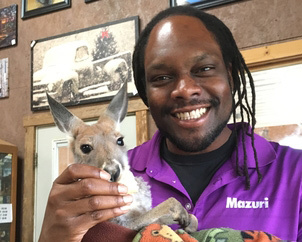 As a part of the Mazuri team, Mark travels to trade shows, conferences, zoos, and collaborates with other exotic animal care specialists on the most nutritional and complete diets that support full and healthy animals.